Flexibility, looks, power all in one midsize truck package. The Chevrolet Colorado Redline is one of several variants to the brand's highly successful midsize truck. While pickup trucks share some of generic similarities, the stylistic differences are always critical and one of the trend setters since it first appeared has been the Chevrolet Colorado. The Colorado seems to be a perfect size for working in urban spaces since it’s relatively easy to maneuver into urban or suburban parking spaces. It also has a spacious interior and looks handsome either sitting at the curb or out in traffic. Chevrolet has also smoothed out the ride by beefing up the suspension and improved the steering and brakes on the truck so it’s easier and more enjoyable to drive even if you are traveling a good distance. Fuel economy with the V6 was 17 miles per gallon in city driving and 24 mpg on the highway. Designing the exterior of a pickup truck requires a great deal of patience, I suspect, because you are working on iconic shape that is deeply embedded in the motoring culture of the United States. The exterior of the Colorado exudes the masculine appeal that has long been associated with the pickup truck. 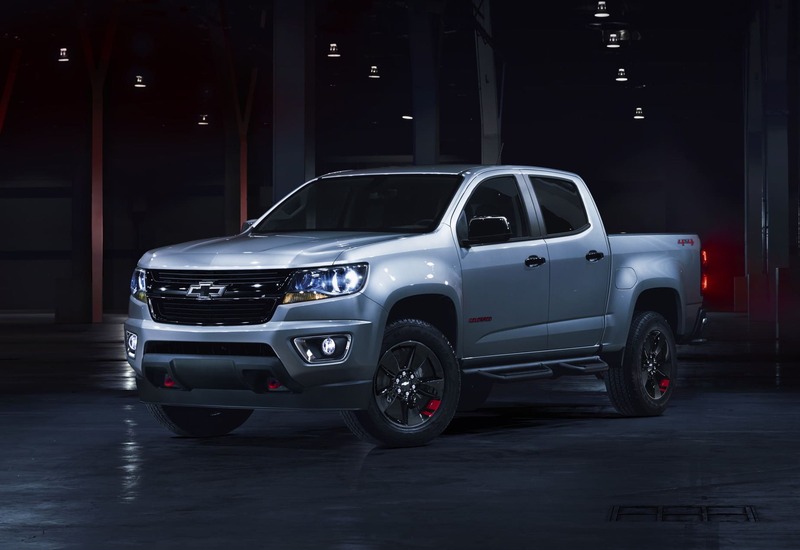 The designers working for Chevrolet also have dressed it up a bit by sharply defining the lighted corners of the vehicles and giving the front end a recognizable with distinct cues at the front and tear that sets it apart from the other pickup trucks on the road. Walking up to Colorado, you know it is a Chevrolet truck. The door handles, side view mirrors, roofline and fenders all work in harmony to signal that this truck comes from a long line of Chevy trucks. However, the biggest changes to come over pickup trucks in the past quarter century are inside the truck’s cabin. Years ago, nobody, not even the uncomplaining owners, seemed to care much about creature comforts inside the cabin, which were routinely subjected to all kinds of abuse on a daily base. Times change, and manufacturers are now competing for buyers by offering new levels and comfort and security. The inside of the Colorado has a completely contemporary feeling with comfortable seats, excellent visibility and ample places to tuck away the gear that is part and parcel of operating a truck day-in and day-out. In addition, while the layout of interior is simple and straightforward, it is artfully furnished with soft-touch material in key places and trim pieces that are neatly matched and contrasted to relieve the tedium behind the wheel and adds to driver stress and fatigue. The special touches on the Redline edition also include black window trim, black mirror caps, black door and tailgate handles, as well as black bowties, black grille and surround and black off-road assist steps and 18-inch wheels with red accents. There are also red recovery hooks up front and a spray-on bedliner to complete a look I suspect is supposed to appeal to both urban cowboys and rural owners. The Colorado also comes with My Link Radio with Bluetooth, rear-vision camera, 8-inch touch screen, electronic stability control, six standard air bags. It also has 4G LTE Wi-Fi hotspot includes three-month/3GB data trial. A Safety Package is available on LT models of the Colorado and includes Forward Collision Alert and Lane Departure Warning, which use camera-based technology to warn drivers of potential crash threats. The features add up and the manufacturer’s suggested retail price for a Colorado Redine is about $33,000. 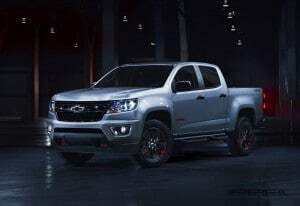 Trucks have come a long way in recent years in terms of driver and passenger comfort and overall drivability, which has also made trucks such as the Chevrolet Colorado more practical and more useful than ever. This entry was posted on Friday, April 20th, 2018 at and is filed under Automakers, Automobiles, Chevrolet, First Drive, GM, Markets, Pickups, Reviews, U.S./North America. You can follow any responses to this entry through the RSS 2.0 feed. Both comments and pings are currently closed. The reason it is comfortable for a “mid-size” pickup is it’s actually BIGGER than the old C- / GMT-series pickups. Park an older 1500 Silverado next to a Colorado and compare. I do it everyday at the office; the Colorado is slightly larger than the 1500. So the “feeling” that it’s more spacious is b/c it is for what was a small/er pickup.